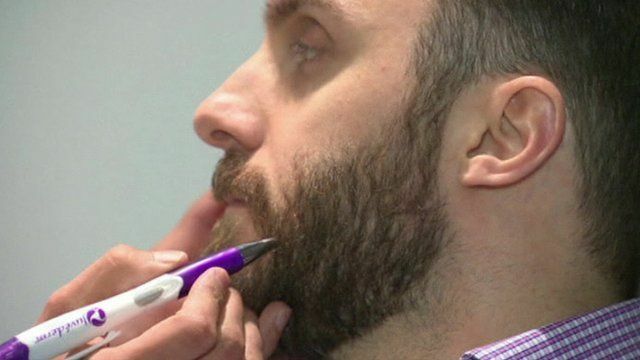 Facial hair transplants on the rise Jump to media player Plastic surgeons in Canada are reporting a surprising increase in the number of patients seeking facial hair transplants. Ewan McGregor: 'I can't shave my beard' Jump to media player Hollywood Ewan McGregor was in London for the premiere of his latest film, The Impossible. Annual beard competition in Germany Jump to media player Around 100 competitors are in the German town of Pforzheim this weekend for their annual beard and moustache championships. Paxman's beard trends on Twitter Jump to media player Twitter went into meltdown on Monday after Jeremy Paxman's facial hair made its Newsnight debut. Brighton hosts beard and moustache contest Jump to media player More than 100 competitors have taken part in the British Beard and Moustache Championships in Brighton. Plastic surgeons in Canada are reporting a surprising increase in the number of patients seeking facial hair transplants. Once transplanted, the hairs are permanent and grow just like facial hair.